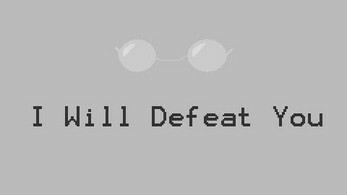 "Hello, my name is Tobwa, and I will defeat you"
An egocentric pair of glasses presents a challenge to you. Finish his series of trials and he will create a (fair) challenge tailored to your weaknesses. There is no losing, only giving up. Give up, and you are banned forever*. I Will Defeat You offers a taste of a variety of games, from platforming to space shooters. Nearly every niche genre can be represented, then shuffled into one of your three trials. At this stage of development there are only three types of trial, resulting in up to eight different end-game challenges. Sound design is in early development, with extra tracks provided by Arcsy Buttons. Extract the installer from the zip file and run it, specifying where you want the game to install. The installer creates two small save files and the main game executable, plus the uninstaller.